Through Pathfinders I worked at the New York State Supreme Court this summer where I gained a better understanding of the way our judicial system works. I was able to listen to hearings and cases and discuss them with judges and law secretaries. Aside from the actual court cases, I also learned how to work with other interns through the diverse programs they had available. For example, I played in a basketball game against the court officers, I was a part of a mock trial team, and I won a professional dress competition. Working there was an amazing experience. The program I participated in this summer though Pathfinders was called the Scholars Program for Teens at the New York Historical Society. The program was a fusion of History, Journalism, and Literature. I was able to use some of the unique resources at the New York Historical Society, such as their special access library, to help me research and write an article for the nonprofit organization, Literary Manhattan. Literary Manhattan is a nonprofit organization that creates a connection between buildings in Manhattan to pieces of literature or an author. The ultimate goal of the program was to do just that. We each had to pick a building in Manhattan and discover its connection to an author or piece of writing. I wrote my article about Tiffany & Co. in Manhattan and its literary significance. Plus, I had the opportunity to meet and work with other students from different parts of the country. 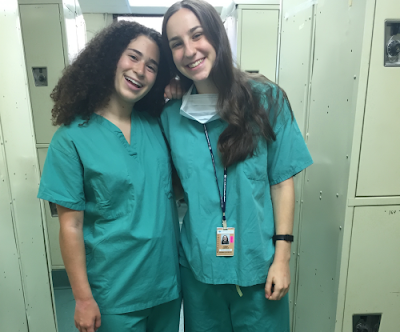 This summer I had the privilege of being admitted into the Women in Science Program affiliated with Maimonides Medical Center. I, along with ten other high school girls including my classmate Leah Linfield, were each given the opportunity to shadow a doctor. I was assigned to shadow Dr. Victor Sasson, an orthopedic surgeon, for the whole month on July. I was able to observe patient care and surgeries, like knee and hip replacements. It was exciting and increased my interest in medicine. What I loved was that everyday brought new people, new stories, and new issues. There was no set routine. Some days I was able to observe the EMG and other days I got to "hang out" in the X-Ray room. I got to interact with all the doctors, residents, nurses, PAs, radiology technicians, and patients. Everyone answered my questions gladly and thoroughly. On Fridays the girls and I would attend resident meetings, lectures and lab simulations where we learned how to cast and scrub in before surgeries. I would definitely recommend this program to high school students in the future who are looking to learn about medicine, gain hands on experience, and meet new people. The opportunities that Pathfinders offered me this summer were life changing. My first internship at JBS Project Management taught me how to read blueprints, organize, and get a first-hand view of what goes on in a construction site. My coworkers were open to teaching me and were very welcoming. After this six week program, I had the opportunity to have a one week program at Bank Hapoalim, where I truly learned what a commercial bank does. They showed me how banks give loans, letters of credit, and I was able to sit one on one with the Vice President. Thank you for an unbelievable summer. At the School of Architecture and Design at New York Institute of Technology this summer I used the tools that architects work with every day and started a portfolio. I learned how to create and cut plans, section models, and work on hatching skills in a small group setting. I worked on presentation skills and learned about depth, perception, and 3D models. I learned about architectural history by visiting conceptual design museums, the NYC High Line, and Roosevelt Island. And I got college credit!